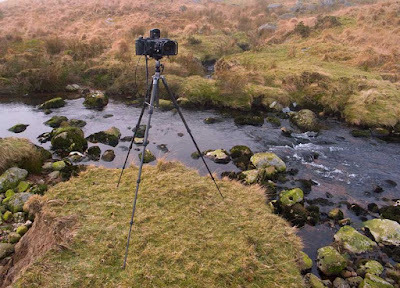 A good tripod is essential for successful landscape photography. For several years I have used a Manfrotto Carbon One 440. It has been a reliable and sturdy platform. Apart from ocassionally having to tighten the lever leg locking screws, the Manfrotto has done it's job very well. Fitted with the 443RCZ ball & socket with quick release head, the total weight comes in at 2.24kg. Even with the Fujinon 300mm tele lens mounted on the Fuji 617, the Manfrotto has proven itself to be rock solid in moderate winds. This sturdiness comes at a price. Even with carbon fibre construction, 2.24kg is a weighty piece of kit to carry on the hill. For a long time I have looked for something lighter and just as stable. This was a bit like searching for the Holy Grail of tripods, but I came across the Gitzo GT1550T Traveller at the Focus on Imaging exhibition in Birmingham in 2007. 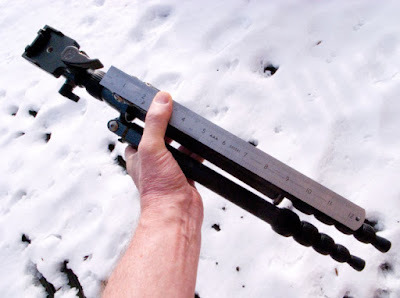 This tripod is so compact in it's collapsed state that I almost passed it by as being too small to be worthwhile. The legs are in five sections which can slow the set-up speed, but the tiny folded size and minimum weight of only 1kg made it worthy of a closer look. ....and extends to a very useful 146cm. It comes complete with a b&s head, which is my preference (I have a strong dislike of pan & tilt heads). With the addition of a Manfrotto q/r plate, the total weight is just 1.2kg - half that of my Manfrotto tripod. Fully extended, the Gitzo GT1550T Traveller is remarkably stable and is now part of my standard equipment for landscape photography. 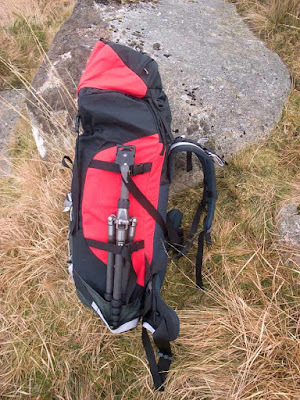 There is a spring-loaded hook at the base of the centre column for hanging a camera bag or backpack from to further improve stability and safety in strong winds. 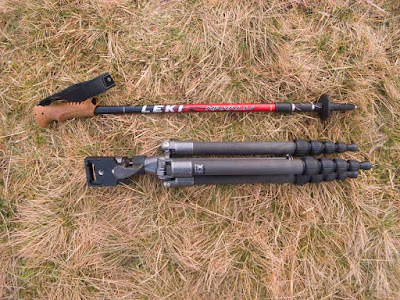 Length comparison with collapsed Makalu Ultralite pole. Strapped to the Macpac Ascent. Feet in the wand pocket and centre column extended slightly to enable the top compression strap to be used to aid carrying stability. 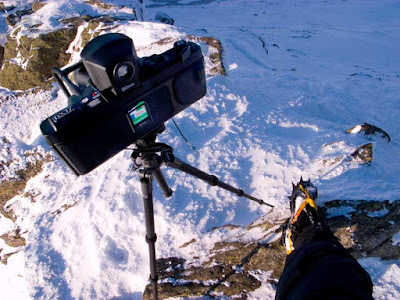 The Gitzo GT1550T Traveller has to be one of the best tripods available for the landscape and travel specialist. This comes at a price. At around £430 to include a q/r plate, it isn't exactly a bargain. However, if you depend upon image sales for your living and want to lighten the load on the hill, then I think this tripod will tick most boxes. With a maximum quoted camera and lens weight of 2kg, it is usable across a range of formats. It is astonishingly stable for it's size, with the usual Gitzo attention to detail and quality. The legs extend and collapse smoothly with no binding and the lock mechanisms are equally smooth to operate. This really is amongst the best of camera platforms. It would be interesting to do a direct comparison between this Gitzo and my Velbon. Dimensionally, they seem to be very similar (1200g v 958g, 35.4cm v 36.0cm, 146cm v 147cm, similar max load capacity) but the prices are significantly different (£430 v £70). I'd be interested to find out exactly what that extra £360 buys you. Next time we meet for a beer, or on the hill, we'll have a tripod-showdown, eh? I'm intrigued by your Velbon. £70 is a bargain. TBH, I got a fair discount on mine, it worked out at about £55 inc. P&P, IIRC. So, do you fancy that beer next week? I'll send you an email sometime soon.